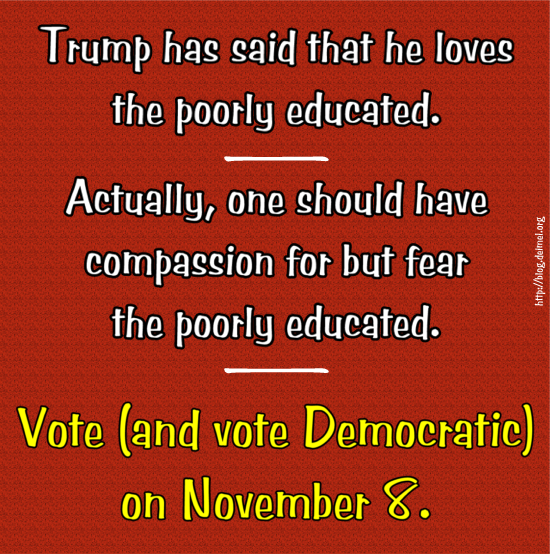 I was dumbfounded when Donald J. Trump declared at a campaign rally, “I love the poorly educated.” Of course he does. The con man earns his bread and butter off the ignorant and the naïve. A person unused to engaging in critical thinking takes statements at face value. Assertions advanced with an air of authority are especially likely to be believed—even more so if they play into longstanding prejudices or grievances, whether real or imagined. One should be sympathetic to Trump’s most vulnerable marks—did we fail to educate them properly?—but those who easily fall victim to the candidate’s mendacious rhetoric threaten the Republic if they vote for their Republican deceiver. It is too late to educate the poorly educated. 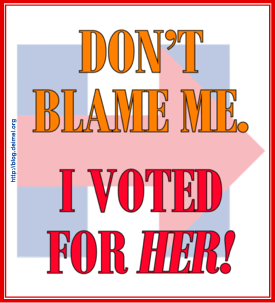 All we can do now is vote, and vote to put someone who is not a charlatan or a narcissistic autocrat into the White House. Whether or not you think she is the perfect candidate—who is, after all?—Hillary Clinton is a compassionate, thoughtful, and competent politician. A vote for a third party is merely a declaration that you, too, are among the poorly educated. Good morning, Lionel. I'm no Trump fan by a long shot, but your piece here reminded me of St. Paul's caution to the Christians of Corinth. Blessings, and with prayers for godly discernment tomorrow . . . .
Brothers and sisters, think of what you were when you were called. Not many of you were wise by human standards; not many were influential; not many were of noble birth. But God chose the foolish things of the world to shame the wise; God chose the weak things of the world to shame the strong. God chose the lowly things of this world and the despised things—and the things that are not—to nullify the things that are, so that no one may boast before him. It is because of him that you are in Christ Jesus, who has become for us wisdom from God—that is, our righteousness, holiness and redemption.